Have you been itching to make trouble in the open world, action racing game everyone is talking about? Now you can. Electronic Arts Inc. (NASDAQ: EA) and Criterion Games today released a single-player demo for Need for Speed™ Most Wanted, the recently launched and critically acclaimed reimagining of the bestselling title in Need for Speed history. 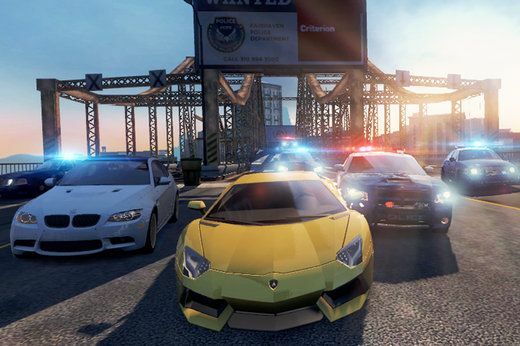 Need for Speed Most Wanted has generated excitement and enthusiasm from players and press around the world. Since launching on October 30, the game has received numerous press accolades including a perfect 5/5 score from UK’sThe Guardian, and 9/10 scores from IGN, Game Informer and the UK’s Edge Magazine. The demo, which is available now for free download on PlayStation Network and Xbox Live®, unleashes gamers into the connected, open world of Fairhaven City where they race, chase and explore their way to become Most Wanted amongst their friends.The Most Wanted demo starts players behind the wheel of one of the game’s most recognisable, rides: the Aston Martin V12 Vantage. Players can also jack into three additional cars placed in different areas of Fairhaven– the Porsche 911 Carrera S, the Audi R8 GT Spyder and the Ford Focus RS500 – if you can find it, you can drive it. Each vehicle has its own unique races, challenges and mods to unlock. Autolog 2 puts social competition at the heart of the experience by tracking and comparing everything players do against their friends and offering up gameplay recommendations and challenges throughout the open world as a result. If there’s something to do, there’s someone to beat – from achieving the best time in a race to the fastest speed through a speed camera. Players are constantly blazing a trail of high scores not only in their game, but in their friend’s games as well. How can you tell which friend has the furthest jump through a billboard? Autolog 2 puts their face on it. New Most Wanted players can achieve up to 50,000 Speed Points in the demo – all of which will carry over into the full game, giving players a flying head start to topping the Most Wanted list. The full Need for Speed Most Wanted experience features seamless, nonstop multiplayer, with no menus and no lobbies – just competition. Gamers are thrust into a continuous playlist of different events with persistent scoring and endless rewards. Players must fight for position on the start line, or turn around to take out oncoming rivals at the finish. Need for Speed Most Wantedis now available for the Xbox 360® videogame and entertainment system with Kinect support, PlayStation®3 computer entertainment system, PC, PlayStation Vita, iPhone, iPad, iPod touch, Kindle Fire devices and Android™. For more information on Need for Speed Most Wanted, visit<gp_link type=”http” loc=”//www.needforspeed.com/most-wanted”>http://www.needforspeed.com/most-wanted. For more information on Need for Speed, visit <gp_link type=”http” loc=”//www.needforspeed.com”>http://www.needforspeed.comor become a fan on Facebook at<gp_link type=”http” loc=”//www.facebook.com/needforspeed”>http://www.facebook.com/needforspeed,follow us on Twitter at<gp_link type=”http” loc=”//www.twitter.com/needforspeed”>http://www.twitter.com/needforspeed and subscribe to our YouTube channel at <gp_link type=”http” loc=”//www.youtube.com/needforspeed”>www.youtube.com/needforspeed. Assets are available at <gp_link type=”http” loc=”//info.ea.com”>http://info.ea.com.